Toward the end of April 2018, gold was fluctuating between USD1350 and USD1315 to the downside. A bearish move began which bottomed out at USD 1160.05 in mid-June 2018. From that point, the gold moved sideways. As at October 1st, a breakout followed from this movement. As a result of this, the market moved sideways again. It was not until the 12th that the market re-tested its earlier breakout level. A breakout from this sideways range and re-test of the breakout level is a much-described scenario in technical analysis. In the following time, this was seen one more time in the gold chart. The last retest was followed by a bullish rise into the USD 1295 range. Currently, the market here has found resistance to the old structural levels in June and October/November 2017 as well as May/June 2018. At this structural level, the market was stable for a few days now and developed a triangular formation. If the market breaks the formation upwards, it would clear to the old highs at 1345 to 1350. The probability that triangular formations, such as this, are resolved upwards is high. 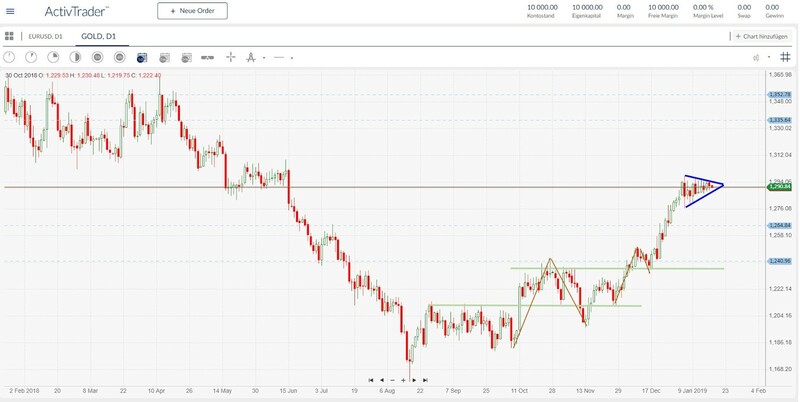 Even if this formation is dissolved in a short direction, the area around USD 1265 would have to provide support to the market to prevent another slide. If there is market breach here as well, the next stop could be the USD 1240 range the market is heading for.